St. Charles is a city located in St. Charles County, Missouri. It has a population of 66,463 residents and rests on 23.65 square miles of land. St. Charles is a restored historic city located along the Missouri River and it has been welcoming new residents since 1769. It was founded by French Canadian fur trader, Louis Blanchette, and the city was named Les Petites Cotes, which translates into “The Little Hills.” It wasn’t until later than it became Saint Charles. Residents love living in the beautiful city because of its many friendly neighborhoods and perfectly gorgeous views of the Missouri River. There are many activities available to participate in including, shopping, dining, entertainment, parks, museums, and historical sites. Homes in the city are abundant and range in sizes and styles. 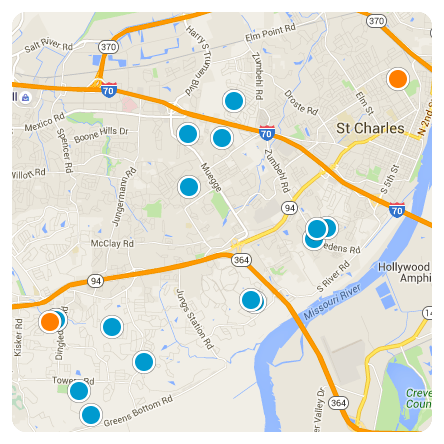 The median price per square foot is $114 and this is higher than St. Louis Metro’s median of $104. If you are interested in purchasing a home in St. Charles, contact us today for more information.